The Brooklyn Kitchen, straddling Brooklyn's Greenpoint and Williamsburg neighborhoods, has something for every type of foodie. Pure Vegetarians in particular will probably want to avoid The Meat Hook inside, but can stock up on vegan chocolate chips and other locally produced food, as well as fine and even some vintage and hard-to-find kitchenware, and plenty of locally-made items like copper cookware, knives and more (I bought my first piece from Brooklyn Slate Co. there). At the current location they also have two fabulous kitchen spaces for rent — great for private events and classes, like this Homemade Tofu class. 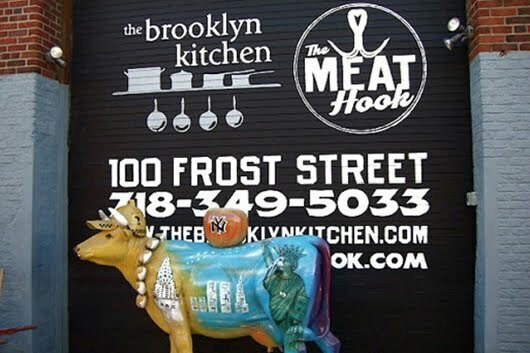 Visit The Brooklyn Kitchen online at www.thebrooklynkitchen.com or in person at 100 Frost Street, Brooklyn, NY 11211.